Growing up in Montvale, N.J., Anaheim Ducks forward Kyle Palmieri had one of the coolest dads on the block. Bruce Palmieri works in construction, and when he noticed his oldest son developing into one of the more talented players in the state, he decided to apply his skills to the cause by building a backyard rink. "I started playing when I was 5 or 6 [years old]," Kyle Palmieri said. "When I started to like it and commit to it and play it every day, he saw an opportunity to give himself another hobby during the winter. He takes real good care of it. He takes it seriously." Bruce Palmieri still puts up the ankle-high boards and floods the backyard every winter, and Kyle said he plans on skating a few laps with his younger brother, two older sisters and other friends and family members during the League's Christmas break if the weather cooperates. With the Ducks finishing a long road trip at the Washington Capitals on Monday, Palmieri will be able to spend part of the NHL's three-day holiday break at home. When he lived at home full-time, Palmieri and his friends certainly got lots of use out of the backyard ice, jumping on at any opportunity. "I'd go out there before practice, after practice, before school," he said. "Any chance I got. "I definitely was one of the only kids in New Jersey to have one. It was pretty cool. My dad's a builder, so he knew what he was doing. It was a pretty nice thing to have. ... We had the lights. He did a great job. It's still up there now. It's a pretty cool place." Palmieri will have another pretty cool place to play outside this season. His Ducks will play the Los Angeles Kings at Dodger Stadium on Jan. 25 (9:30 p.m. 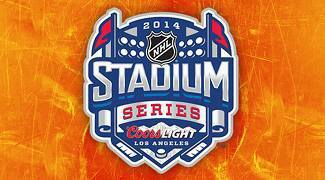 ET, NBCSN) as part of the 2014 Coors Light Stadium Series. "It'll be a little different playing in Southern California," Palmieri said. "The temperatures in New Jersey in the winter getting below freezing is what you'd expect for pond hockey. Going out there, 65, 55 degrees and palm trees surrounding you, it'll be pretty weird, but pretty exciting." Palmieri said he's talked to friends around the League who have taken part in outdoor games at all different levels, asking them for advice on what to expect. However, none of them have played an outdoor game in the kind of setting the Kings and Ducks will experience at the famed baseball stadium. "I don't think we're going to need the stocking caps and stuff like that to keep us warm," Palmieri said. "I'm going to go out on a limb and say there won't be any snow falling on the ice. It'll be a little different than anyone else's experience." The uniqueness of the first West Coast regular-season NHL outdoor game is what makes it that much more fun. "I think it's a pretty big honor we have to have that first outdoor game in a climate like that," Palmieri said. "It'll be a different experience. I think everyone's really looking forward to it."